Blair Painting was established over 50 years ago by my father, Dan Blair Sr. His worked consisted primarily of commercial painting projects throughout the Baltimore area. He was extremely well respected in his craft. Thirty years ago, when my father retired, I accepted the challenge to take over the company and established Blair Painting and Contracting Co., Inc. Over the years, I have been fortunate enough to successfully secure many commercial clients including the Smithsonian Institute Museum of Natural History, Smith Castle, Museum of American History, and the Hirshhorn Museum located in Washington, D.C., as well as many high profile interior and exterior projects for Johns Hopkins Hospital, many management companies in the Greater Baltimore area, as well as multiple high-end custom residentials. As a hands on owner, I estimate, manage, and coordinate each and every project we undertake from start to finish. I am personally committed to the successful completion of every project. 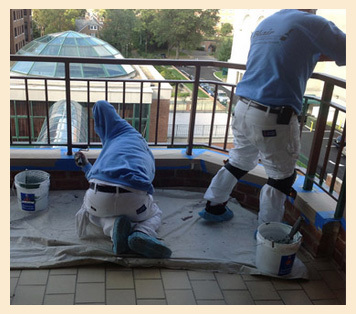 Blair Painting & Contracting Co., Inc. has provided first class professional painting services for over 30 years. We pride ourselves on our unparalleled quality workmanship and neatness which has earned us respect and success that only Blair Painting can offer you. What separates Blair Painting & Contracting Co, Inc. from the others? Simple. Our commitment to quality and our dedication to customer service. We take the extra time to produce quality results. When it comes to paint, we've got you covered! We service the Greater Baltimore and surrounding areas including but not limited to Washington, D. C., Virginia, Maryland, Pennsylvania, and Delaware. We will provide services to any of the Tri-State areas upon request! Blair Painting is an A+ Rated Business with the Better Business Bureau, is an EPA Lead Safe Certified Company, and have remained in excellent standing with the Maryland Home Improvement Commission.